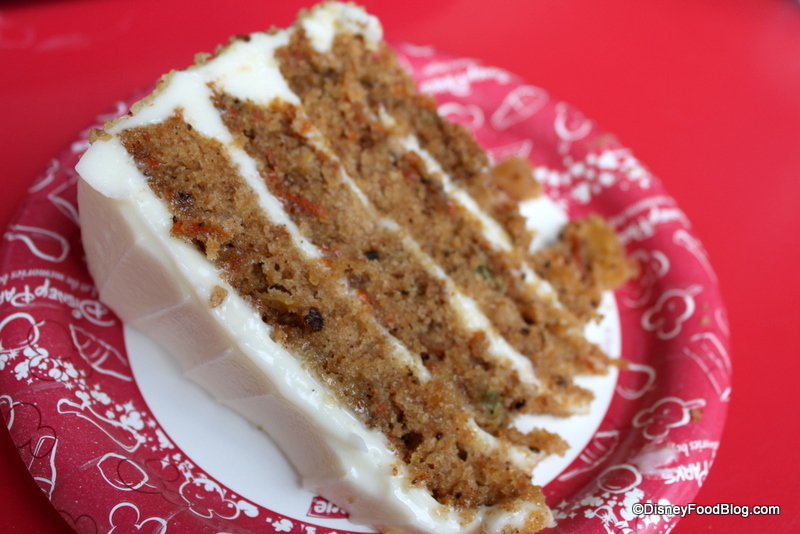 So, I’ve been compiling data for this post for a long time, and I’m ready to share what I think are the best Disney options for carrot cake lovers like me! I hope you’ll share in the comments what your favorites are — and if I missed any, I’d love to know about it (more research is always good)! Here are my reviews, from best to worst! Goofy’s Candy Company is more often known for its make-your-own confectionery creations, but every once in a while you’ll find a hidden gem in the bakery case of this Downtown Disney mainstay. Plus, the wonderful staff here is more than enough draw to stop by and pick up a sugary treat. 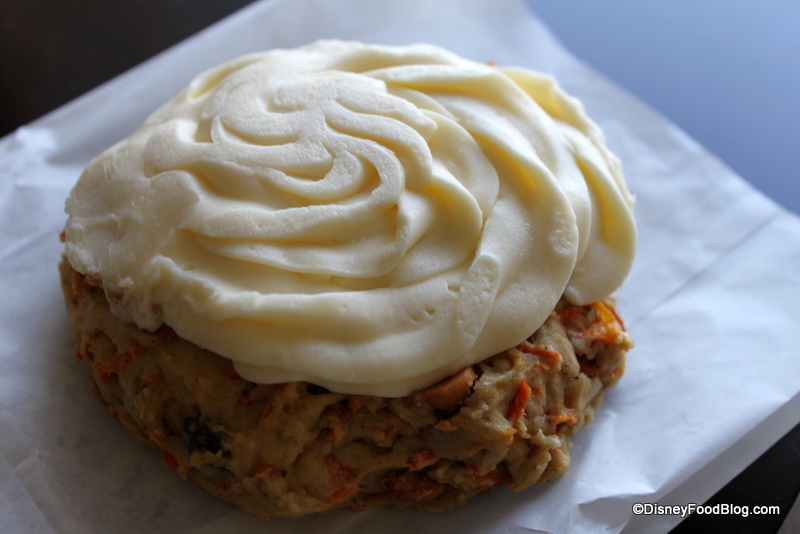 I saw this Carrot Cake Cookie at Goofy’s and then saw it again at the Main Street Confectionery in the Magic Kingdom, so I think you can get this bad boy in several different locations from time to time (though they may not be there during your stay). I didn’t have high hopes for this snack when I first saw it; I figured it’d be dry and hard or — even worse — soggy! It was none of those things. 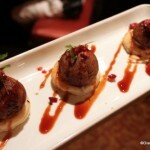 It was heavy, yes, but very moist and packed with yummy add-ins like plump, juicy raisins. The taste of the cookie itself was great — and if I’m willing to enjoy a version of carrot cake without the icing, that’s saying something! It would easily have been a satisfying treat without the piles of cream cheese frosting swirled on the top, but the addition of that rich icing made it one of the best snacks I’ve had on Disney property. Diners seek out gourmet cuisine at the Wolfgang Puck Cafe located in Downtown Disney’s West Side. In the first floor Grand Cafe, you’re met with Zack-Morris-esque designs and colors and a bustling atmosphere. We’ve got a review of this place coming up, and while my dinner was fine, it was the dessert that made me want to come back again and again. 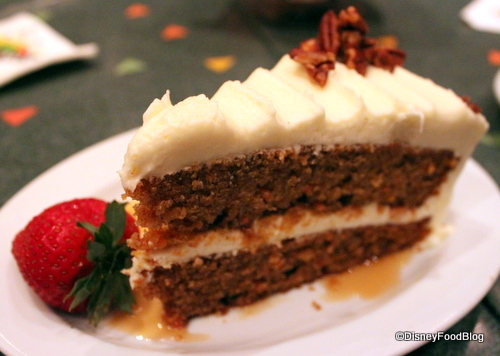 The carrot cake here is…inspired! Super-moist cake (they must be back there basting it with sugar syrup or something); thick, rich frosting; and a great presentation. I like cupcakes, but I’m a sucker for a good old-fashioned slab of cake! 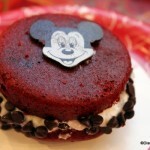 When guest author Michael S. found this cupcake at Disney’s Wilderness Lodge and reviewed it for us, I couldn’t wait to get my hands on one (sometimes not living in Orlando can be a real problem). I wasn’t sure what to expect (other carrot cake cupcakes hadn’t turned out all that well recently), but this thing is over-the-top amazing. That swirl of frosting on top? Not at all gritty. It’s smooth, unbelievably creamy, and still extremely thick. Whoever makes that frosting has a gift…a GIFT! The cake wasn’t filled with goodies, but it was moist and definitely had good flavor. It’s easy to pass by the Writer’s Stop in Disney’s Hollywood Studios as the more prominent Sci-Fi Dine-In Theater is next door and Toy Story Mania is just down the street and around the corner. But take a moment to drop by and you’ll discover a quaint bookstore-style hang-out offering pub tables and cozy chairs in front of a black and white TV playing cartoons! This coffee shop serves barista-style brew too, and the bakery case is always full of goodies. The original Carrot Cake Cookie is a massive confection: two soft cake cookies sandwich a thick layer of cream cheese icing. (Those New Englanders who know whoopie pies will understand this dessert immediately.) The frosting is phenomenal, but the cake itself — springy instead of moist, and devoid of extras like nuts and raisins — is the downfall of this snack. That said, I still think it’s a contender for its sheer size and frosting quota! While it offers breakfast items and light sandwiches, the Main Street Bakery never fails to tempt with homemade treats in a turn-of-the-century building. The aromas waft out to the street capturing the interest of guests heading in (or out) of the Magic Kingdom. In this case, I was extremely excited to see a piece of carrot cake in the pastry case, ready for the taking! I snatched it up and headed for a table! Sadly, this wasn’t as fabulous as it looks. You’d think it’d be moist and flavorful, wouldn’t you? But no, it’s pretty tasteless, actually. 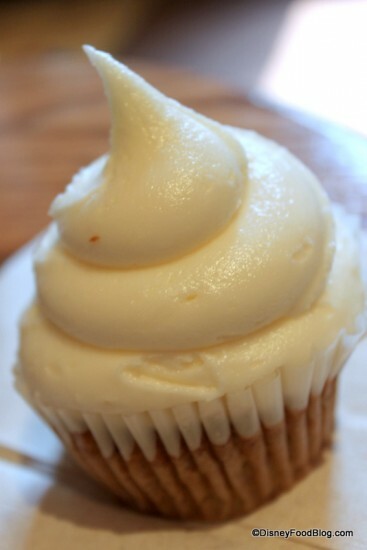 And the frosting is the same gritty concoction found on the Confectionery Carrot Cake Cupcake below. While this one’s not horrible, it certainly wasn’t my favorite snack. There’s just no Wow factor here. They do get points for the three layers, though! More layers = more frosting. Stepping into the Main Street Confectionery in the Magic Kingdom, your senses will be overwhelmed with the sweet aromas of candy as you browse the turn-of-the-century shop. 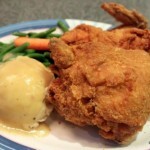 A closer look will also unveil a display of freshly prepared, old-fashioned baked goods. 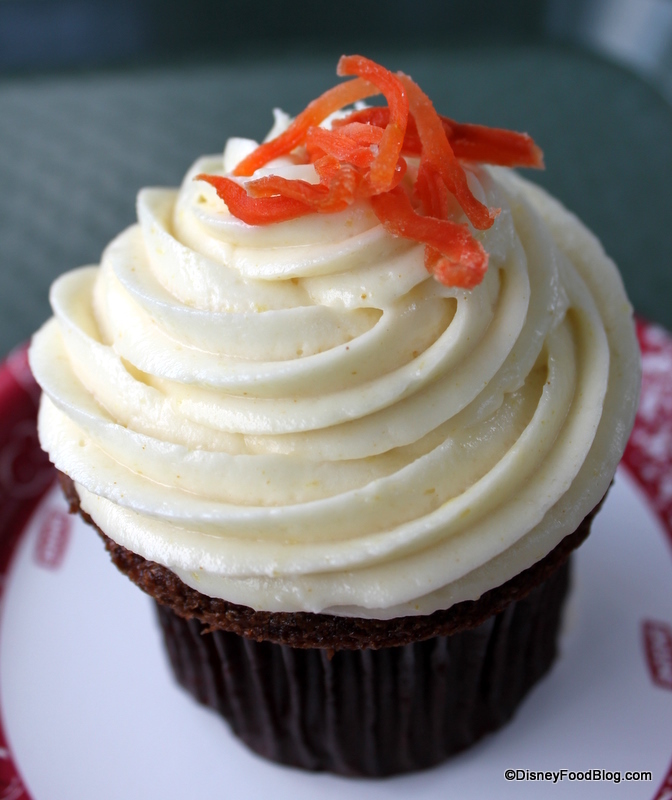 I was thrilled to find this carrot cake cupcake on display in May, and I couldn’t wait to sit down and sample it. Sadly, I wish I had waited. This is clearly from the line of the pink and blue cupcakes and offers relatively tasteless cake and gritty, too-sugary frosting. I actually had to taste the frosting twice to convince myself it was supposed to be cream cheese flavored. I’d best describe this as a larger version of the counter-service carrot cake dessert. This one’s not your best bet. 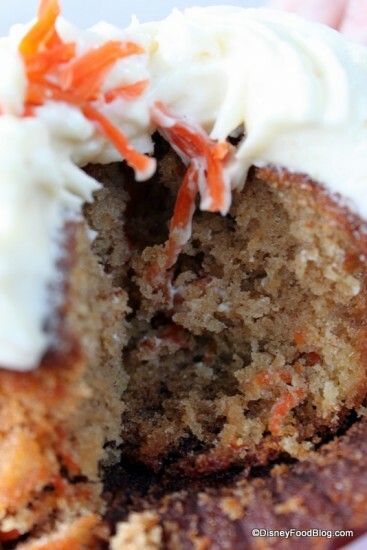 If there’s a carrot cake cookie of any kind nearby, skip this cupcake and move on to the good stuff. Then again, if you just need a frosting fix and you need it now, this could easily fit the bill. « Cupcake Lovers Weekend at Hilton Orlando Bonnet Creek! I love carrot cake, it was my wedding cake! I like to believe it is because of the vegetable element that I justify this is the perfect cake, but lets be real it is totally the frosting! 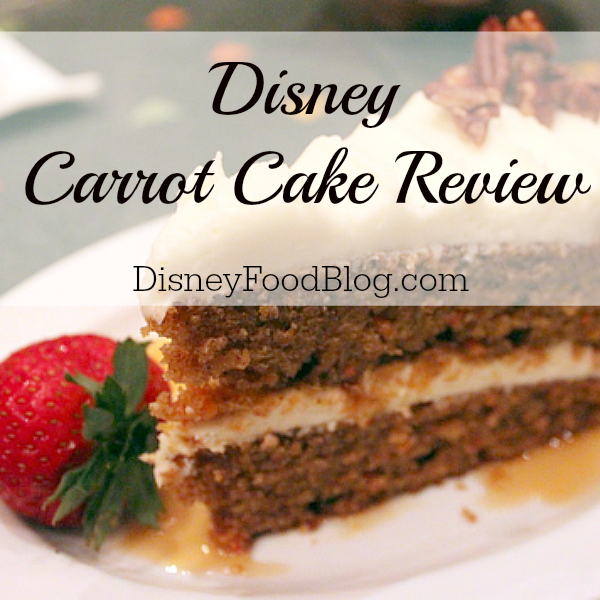 On our last trip to Disney we all fell in love the carrot cake that was an option as a dessert with many of the counter service meals. For a quick little treat after a burger or salad, it was delicious! We always stay at the All Stars Resorts and my children were tickled to see the carrot cake sold in the food court. Had the carrot cake at the bakery too, heavenly. Blergh. I hate carrot cake! But my darling other half loves it, and so I thank you for the article as it means when we next visit WDW in November, I can allow him to use his snack credits for the odd CC Cookie etc. I’m sure I can find something equally scrummy for me at the same time that doesn’t involve vegetables and cake in the same mouthful!! I agree with you, the carrot cake cookie is my favorite! I really wasn’t expecting a lot but it shocked me after the first bite. Hm..wish I could get over there right now for one. AJ, can I please request a similar article… about red velvet cupcakes? Red velvet is my preferred vehicle for cream cheese frosting 🙂 Can’t wait to try the red velvet cheesecake cupcake this September! I always remember carrot cake for the “trick” my mom played on us as kids. She called it spice cake in order to get us to try it. We enjoyed it and it was only after it was all gone that she admitted it was carrot cake. My stubborn veggie hating self swore I would never eat it again! Fortunately as an adult I outgrew the veggie fears, and reading this post is making me crave carrot cake! The carrot cake cookie looks especially good to me. The carrot cake cookie is heavenly at the Writer’s Stop!! In fact, we made a special stop into the WS, just for this cookie! 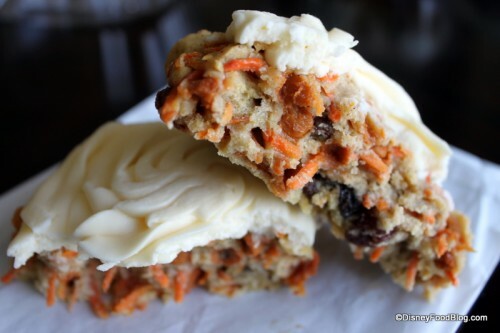 For someone who doesn’t want to find nuts in her carrot cake/cookies, this was perfect! Plus there is a HUGE amount of frosting between these very large cookies!! I highly recommend this cookie to anyone- you really won’t be disappointed! Even my son who wasn’t a fan of carrot cake loved it!! What a carrot cake cornucopia! 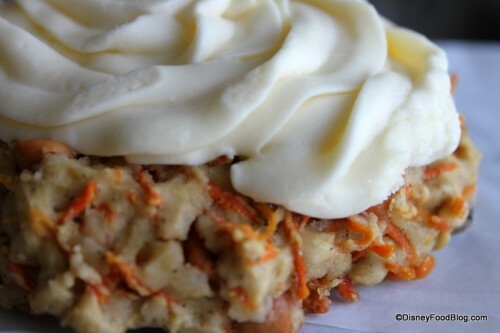 I have only had the carrot cake cookie at Writer’s Stop and the carrot cake dessert from CS places. The CCC at WS reminded me very much of an oatmeal pie (which I love, btw). The CS dessert was always, for me, a better option than the chocolate cake. 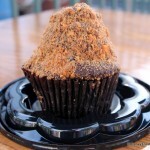 As for the ones you reviewed today, I am anxious to sample to the one from Goofy’s/Main Street Bakery as I LOVE all of the added extras! “Zach-Morris-esque” – you crack me up! We had the cookie from Goofy’s just a couple of weeks ago. Definitely a must try if you are a fan of carrot cake. We loved it. @Emma Godbold, this one is not at all “wet” from grease. It is substantial and yet nice and moist. I think you’ll enjoy it far better. I had the cookie years ago at the old Gourmet Pantry. I was crushed when the Pantry closed. I thought the cookie was gone for good. I have never gone into Goofy’s but you can be sure I will now. Thank you so much! I’m not a big fan of carrot cake. Can I just have the frosting? I LOVE the carrot cake cookie at Writers stop in the studios… we always same room for one when we’re there! oops… “SAVE” some room that is! I have never had anything at Goofy’s Candy Company. Part of being pre-diabetic I guess. Now it looks like I have to enter and try the carrot cake. Dangerous territory here. 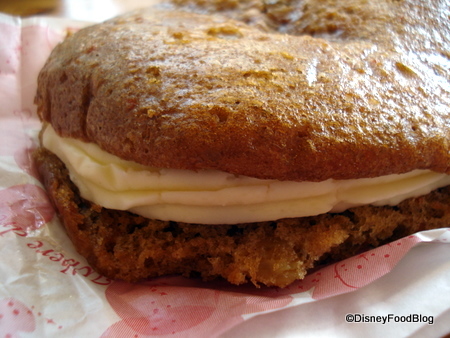 The Carrot Cake cookie at Goofy’s is made by the same as the German Chocolate Cake cookie. Selma’s Bakery is the supplier of those great cookies. Unfortunately, I was informed during my trip in May that they no longer carry the German Chocolate Cake cookie, on the Carrot Cake…half of a dissappointment. One of the things I like best about the writers stop version is that it doesn’t have to add the extras. Just cake and icing, the way it should be. I am with Katie, Red Velvet is the best vehicle for cream cheese frosting. Would love to know your top to bottom list on that one. The Writer’s Stop version should get some bonus points for being the most portable of the group. I never have room to eat snacks during the day, but it makes an excellent breakfast the next morning at the resort. It also doesn’t have to be super isolated from the other treats in the bag as the rest of the family can’t eat nuts. I know you didn’t do quick service in this post, but I have to say, the absolute worst excuse for carrot cake (which honestly, is hard to mess up, right?) is the one they serve at Cosmic Ray’s in the MK. It’s so bad, even my kids won’t touch it. Love, love, LOVE the carrot cake cookie at the Writer’s Stop!!! AJ I am salivating!! I kind of want to say thank you for pointing me to this page, however I now have MORE carrot cake items on my January wish list! The cookie at the top looks divine, I tried the German cookie a couple of years ago and loved it, so I’m sure this will be lush and RIGHT up my alley!! 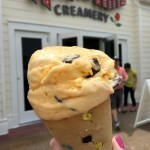 Just got back from my Disney trip and had found Writer’s Stop…it was an amazing hole in the wall at WDW! Especially during the very crowded Star Wars weekend. I loved the carrot cake cookie, my only complaint is that I don’t like raisins in mine, but other than that, it was AMAZING!! I tried a very unique and excellent carrot cake at ESPN Zone at Downtown Disney in Disneyland a few years ago. I believe it’s still on the menu, and worth a try if you’re in that area. I finally tried the carrot cake cookie and whiIe I love almost everything Disney, I am not a fan of this sugary concoction. I was very disappointed. The cake was too sweet and the frosting was too, too sweet, did not taste like cream cheese and was plain disgusting. I’ll stick to my own homemade carrot cake with true cream cheese frosting, both without all of the unnecessary extra sugar. If you truly love carrot cake and have had a good homemade carrot cake you will not like this so called “cookie”!! Do not waste your money on this. Yuck! !